^ a b c Fejes Tóth, L. (1953). Lagerungen in der Ebene, auf der Kugel und im Raum. Die Grundlehren der Mathematischen Wissenschaften in Einzeldarstellungen mit besonderer Berücksichtigung der Anwendungsgebiete, Band LXV. Berlin, New York: Springer-Verlag. MR0057566. ^ Kepler, Johannes (1611). Strena seu de nive sexangula (The six-cornered snowflake). ISBN 978-1-58988-053-5. MR0927925. http://www.thelatinlibrary.com/kepler/strena.html. Lay summary. ^ Gauss, Carl F. (1831). “Untersuchungen über die Eigenschaften der positiven ternären quadratischen Formen von Ludwig August Seber”. Göttingische gelehrte Anzeigen. http://gdz.sub.uni-goettingen.de/dms/load/img/?IDDOC=267233. ^ Rogers, C. A. (1958). 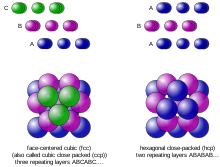 “The packing of equal spheres”. Proceedings of the London Mathematical Society. Third Series 8 (4): 609–620. doi:10.1112/plms/s3-8.4.609. ISSN 0024-6115. MR0102052. ^ Hsiang, Wu-Yi (1993). “On the sphere packing problem and the proof of Kepler's conjecture”. International Journal of Mathematics 4 (5): 739–831. doi:10.1142/S0129167X93000364. ISSN 0129-167X. MR1245351. ^ Hsiang, Wu-Yi (2001). Least action principle of crystal formation of dense packing type and Kepler's conjecture. Nankai Tracts in Mathematics. 3. River Edge, NJ: World Scientific Publishing Co. Inc.. ISBN 978-981-02-4670-9. MR1962807. ^ Hales, Thomas C. (1994). “The status of the Kepler conjecture”. The Mathematical Intelligencer 16 (3): 47–58. doi:10.1007/BF03024356. ISSN 0343-6993. MR1281754. ^ Hsiang, Wu-Yi (1995). “A rejoinder to T. C. Hales's article: ``The status of the Kepler conjecture”. The Mathematical Intelligencer 17 (1): 35–42. doi:10.1007/BF03024716. ISSN 0343-6993. MR1319992. ^ Hales, Thomas C. (2005). “A proof of the Kepler conjecture”. Annals of Mathematics. Second Series 162 (3): 1065–1185. doi:10.4007/annals.2005.162.1065. ISSN 0003-486X. MR2179728. http://annals.princeton.edu/annals/2005/162-3/p01.xhtml. ^ Hales, Thomas C.; Ferguson, Samuel P. (2006). “A formulation of the Kepler conjecture”. Discrete & Computational Geometry 36 (1): 21–69. doi:10.1007/s00454-005-1211-1. ISSN 0179-5376. MR2229658. ^ Henk, Martin; Ziegler, Guenther (2008). La congettura di Keplero. La matematica. Problemi e teoremi. 2. Torino: Einaudi. ^ Hales, Thomas C.; MacLaughin, Sean (2010). “The dodecahedral conjecture”. Journal of the American Mathematical Society 23 (2): 299–344. arXiv:math.MG/9811079. doi:10.1090/S0894-0347-09-00647-X. Hales, Thomas C. (2000), “Cannonballs and honeycombs”, Notices of the American Mathematical Society 47 (4): 440–449, ISSN 0002-9920, MR1745624, http://www.ams.org/notices/200004/ An elementary exposition of the proof of the Kepler conjecture. Weisstein, Eric W. "Kepler Conjecture". MathWorld（英語）.